Stories involving Animal Welfare Master’s and PhD students. PhD Candidate is in the June issue of Vancouver magazine! A study led by Heather Neave, the first to use a cognitive bias test to address the emotional response to pain in non-human species, found calves showed signs of pessimism after having their horns removed. Gosia Zobel, a PhD student in UBC’s Animal Welfare Program, took home the coveted award for best student presentation at the University of Guelph’s 6th Annual Animal Welfare Symposium. Gosia’s presentation discussed emerging health and welfare issues for dairy goats. Her energetic and simple presentation style earned the audience’s approval. 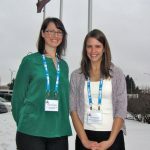 For the first time ever students were able to give short, practical talks about their research at Western Canadian Dairy Seminar. These talks were judged by a panel of experts who decided to award the first place prize to both Gosia Zobel and Katy Proudfoot – two PhD students in the UBC Animal Welfare Program! New article in Human Dimensions of Wildlife by AWP PhD Candidate Sara Dubois calls for a new “humane” dimension in wildlife management.